NB Liquor has given Shane Steeves approval to operate a nano brewery out of his basement in Hammond River. New Brunswick is getting a new brewery this week. NB Liquor has given Shane Steeves approval to operate a nanobrewery out of his basement in Quispamsis. Steeves has been brewing beer in his "giant man cave" basement for years. He has now been licensed by NB Liquor to sell what he brews, making Hammond River Brewery the seventh craft brewery in the province. "It was actually this time last year that I decided to make the leap and go commercial and just kind of take it to another level, rather than home-brewing for myself," said Steeves. Four of the craft beers brewed by Steeves will soon be selling at pubs in the area. The Saint John Ale House will be offering Steeves' beers for sale and owner Peter Stoddart expects them to be popular. Shane Steeves currently brews 160 litres a beer a week in his Hammond River Brewery. (CBC)"So it's a real specialty product, because he's not doing mass production," said Stoddart. 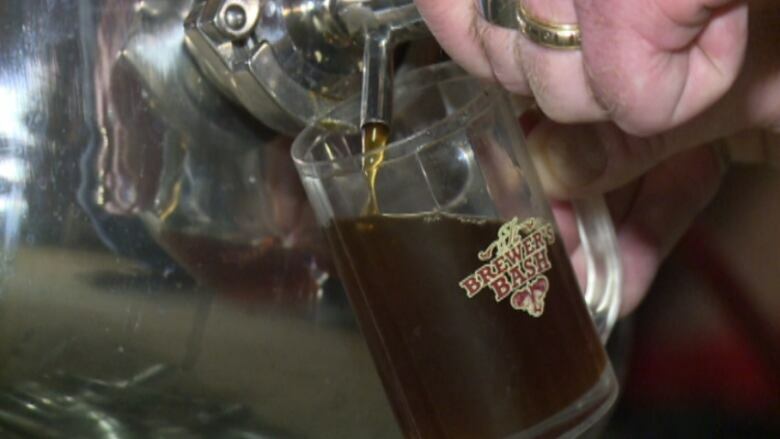 "It's a real neat thing for people to try a beer that's made right here in Quispamsis. "So I think the longevity of a program like that is excellent and they can kind of grow." Steeves currently produces about 160 litres of craft beer a week. "As far as how much beer I will be delivering, I guess that will depend on how much beer they go through, how much they sell," he said. "And at this point it's an unknown. "I don't know if I'll have excess kegs or if I won't be able to keep up with the demand." Marcelle Saulnier of NB Liquor says sales are strong for New Brunswick's craft brewers. "Our craft beer selection is definitely growing and people like to buy local and want to try out beers from different parts of the province," she said. "It's definitely a win-win situation for both parties."